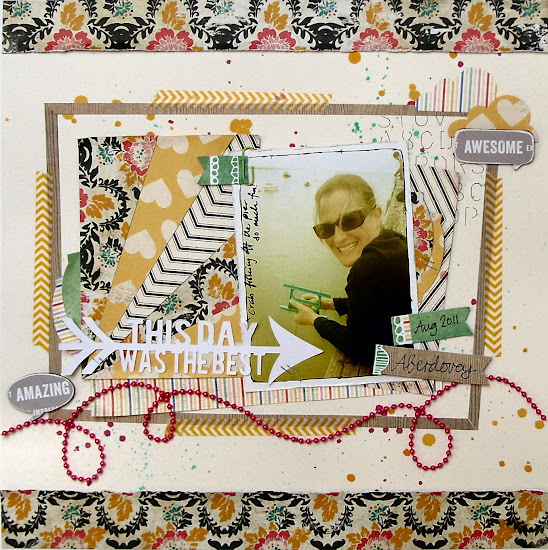 I took inspiration from a few places for this layout, as soon as I saw this gorgeous Layout I knew I wanted to do my own version of it and this cute little idea was going to appear somewhere too. Plus I've been trying out a few new techniques, I've diligently been practising the cursive style of handwriting over the past few nights because I always think my writing makes my layouts look untidy, there's a way to go yet but I'll keep practising! Of course I couldn't go without telling you the rest of the robo saga, after finally pulling Mr Robo out of retirement (he's been languishing in a cupboard for about 5 years after failing to get to grips with him first time round) I failed miserably cutting my title with the Websters PP that I wanted to use. In the end I used copy paper, less tears (that's tears, not tears... you know, the ones that fall down your face...) if it all goes pear-shaped, and I still had to cut out all the little holes myself! Will keep practising with my robo too, there's always something to learn with this fantastic hobby isn't there? Again, any questions you have about the layout please leave it in the comments and I'll be happy to answer it for you.